Blue Whale at sea off Mirissa, Sri Lanka, April 12th. 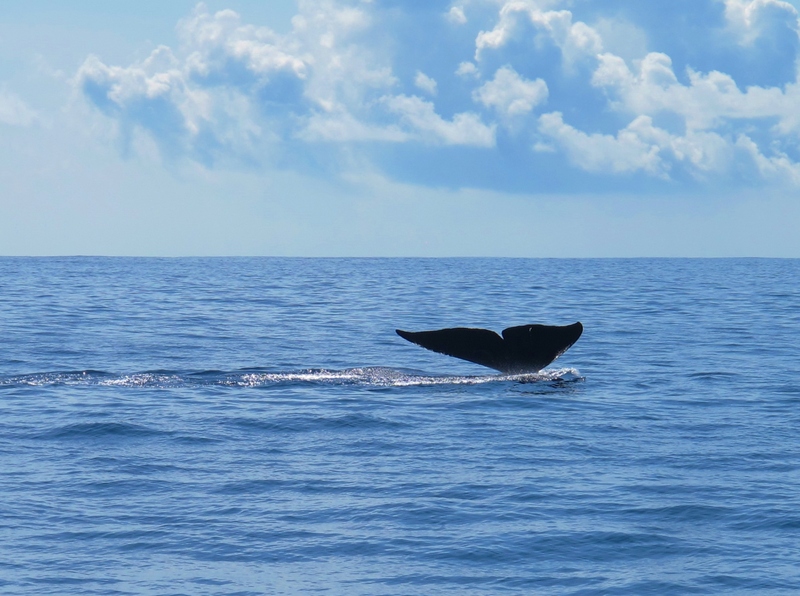 The southern Sri Lankan coast is one of the few places in the world where Blue Whale is reliably seen, and April one of the very best months for sightings. We joined a fleet of tourist boats setting off from Mirissa early in the morning, to the prime whale area about an hour’s boat ride from shore. Over a 90-minute period, we saw a Blue Whale surface three times – a truly magnificent animal and definitely one for the “bucket list”. In terms of the birds, tropical seas – away from breeding islets – can often be rather quiet for seabirds, and that was the case today. The only notable sightings were two large and fairly distant tern flocks, containing many summer-plumaged White-winged Terns and a handful of Bridled Terns, as well as many that remained unidentified due to distance. Also out here were at least three Flesh-footed Shearwaters passing fairly close to the boat. We stayed in the town of Unawatuna, near Galle, which although a touristy beach resort did have the saving grace of a wooded hill close by. Our hotel – the Nooit Gedacht – also had extensive gardens including a lotus pond where many birds were seen. Loten’s and Purple-rumped Sunbirds were common and easily seen, and White-browed Bulbul, Green Imperial Pigeon, Brown-headed Barbet and Black-rumped Flameback were among the many birds nesting in the gardens or nearby. Other birds regularly seen around the hotel included the endemic Sri Lanka Green Pigeon and Sri Lanka Swallow, with Crimson-fronted Barbets common on the hill behind the hotel and Dark-fronted Babbler also seen there. Finally, an early morning trip to Koggala Lake produced few birds at the lake itself, but the nearby airfield had a pair of Indian Stone-Curlews and several Ashy-crowned Sparrow-larks. Lifers: Sri Lanka Swallow, Purple-rumped Sunbird, Loten’s Sunbird, Yellow-billed Babbler, White-browed Bulbul, White-bellied Drongo, Brown-headed Barbet, Crimson-fronted Barbet, Sri Lanka Green Pigeon, Black-rumped Flameback, Dark-fronted Babbler, Pale-billed Flowerpecker, Indian Swiftlet, Indian Stone-Curlew, Ashy-crowned Sparrow-lark (total 1,884). Year ticks: Green Imperial Pigeon, Flesh-footed Shearwater, Bridled Tern, White-bellied Sea Eagle, Tickell’s Blue Flycatcher (total 578). 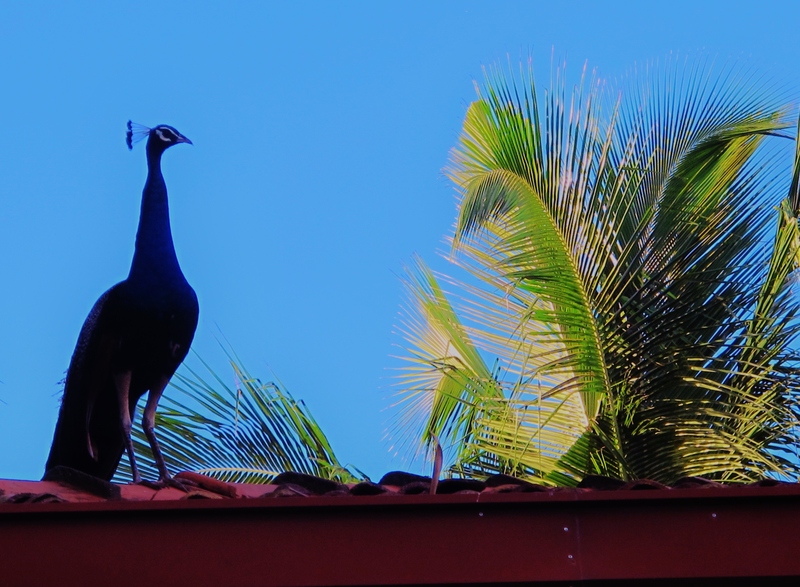 Indian Peafowl on the roof of our Unawatuna hotel.